In a world of mechanisation and technological advancement, it may seem that machine-made surgical instruments would be far superior to hand-crafted Stille instruments. However, an independent study(1) carried out in 2012 found this not to be the case. Comparing the performance and durability of hand-crafted Stille SuperCut Metzenbaum scissors with conventionally manufactured German and Asian equivalents, the Stille scissors were shown to have the edge. Carried out by researchers at the Royal Institute of Technology in Stockholm, Sweden, the study investigated differences in both material and manufacturing quality. This included a Scanning Electron Microscope (SEM) inspection to analyse composition, a Vickers hardness test, a Light Optical Microscopy (LOM) examination of the microstructure and a durability test. One aspect that set the Stille scissors apart was their fine martensitic structure, which allowed them to outperform the other brands in terms of both mechanical and chemical wear. 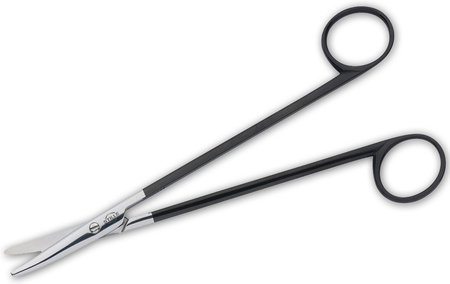 In addition, in the durability test, the Stille scissors were the only ones able to cut without using excessive force even after severe mechanical stress. So what is it about Stille’s approach to manufacturing that creates such superior instrumentation? Stille’s dedication to producing only the best instruments begins with its selection of raw materials. As a result, they only use premium steel bars to ensure that every molecule is directed along the bar throughout the manufacturing process. By starting the manufacturing process from the raw material stage, Stille really sets itself apart. That is because, to create surgical instruments, many manufacturers buy in punched-out parts from sheet metal called ‘Drop Forgings’ or ‘Stampings’, which they then process mechanically. However, Stille creates its own stampings by hand; trimming, shaping and polishing these manually. Not only does this achieve rounder and finer edges on instruments such as scissors, it also ensures that all Stille instruments are lighter, thinner, stronger and more durable than machine made brands. What’s more, whereas mechanised manufacturers often polish the instrument surface with chemicals, Stille’s master craftsmen manually polish their instruments, giving them a highly polished surface, which is easier to clean and more resistant to corrosion. By carrying out much of the manufacturing process manually and focusing on quality at every stage from sourcing materials to carrying out the final inspection, Stille is the only surgical instrument manufacturer that can offer a 30-year guarantee. This warranties that their instruments will be free from defects in material and workmanship for thirty years from purchase. As such, Stille promises to repair or replace a damaged instrument free of charge if the damage is found to have been caused by a defect in material or workmanship. 30 years is effectively a practice-lifetime for many surgeons and is far longer than the warranty offered by other competitors who typically guarantee their products for only ten, five or even three years. Despite this, a study carried out at a Swedish surgical centre found that 74% of the Stille instruments tested there had actually been in use for over 50 years,(2) making a 30-year life expectancy look quite conservative. Want to learn more about how Stille instruments are made? You can learn more about Stille’s manufacturing processes by clicking here to watch a video about how Stille instruments are hand-crafting to achieve the highest quality. You can also find out more about our Stille SuperCut Scissors by clicking here. (1) Authors: Engblom E amd Bern P: Hand forged surgical instruments superior in performance and durability as compared to conventionally produced German and Asian instruments.